DREAM AHEAD (USA) (Bay or Brown 2008-Stud 2012). 6 wins-3 at 2, Newmarket July Cup, Gr.1. Sire of 434 rnrs, 220 wnrs, 20 SW, inc. Al Wukair (Deauville Prix Jacques le Marois, Gr.1), Shumookh, Donjuan Triumphant, Dark Vision, Tornibush, Dreams Aplenty, Sweety Dream, Final Frontier, Basileus, Gold Tail, Mozart, Pursuing the Dream, Dream of Dreams, Gorane, Peach Melba, Tisbutadream, Visionary, Awaken, Generalissimo, Ken's Dream, SP Dream Today, etc. Oh No Not Again (f. by Moshe). Winner at 1250m in 2017-18 in Aust. Oneira (f. by Dream Ahead). See below. El Casco (g. by Helmet). Placed at 2 in 2016-17 in Aust. Dysfunction (More Than Ready). 4 wins from 1350m to 1650m, A$97,650, BRC QLD Electrical Pty Ltd H., Woolworths H., 2d BRC Calaway Gal S., L, Xmas Parties at the Races H., St Margaret's Girls School H., Australian Workplace Test & Tag H., Brc.com.au H., Ipswich TC Queensland Times H., 3d BRC Gallipoli Medical Research Foundation P.
Pienkna. 4 wins to 1200m, A$131,750, to 2016-17, BRC Australian Open Polo Doomben H., Sprite P., Skyracing.tv P., Ipswich TC Back Yard Rugby League Program H., 2d BRC Tim Bell Memorial H., SCTC Coastline BMW X5 H.
Toorak Tower. 3 wins at 1400m, 1600m in 2016-17, Whangarei RC Northland Veterinary Group H., 2d Whangarei RC Northland Cup, 3d Whangarei RC Fell Engineering H., 4th ARC 3YO Salver, L.
Herewegoagain. 6 wins. See above. Roving Red. Winner at 1500m, 3d ATC Mark Moran Spirit of Life P.
Another Jay Brown. 2 wins at 1600m, 1650m to 2017-18 in Aust. Dashing Charger. Placed in Aust. VIGNOR (Flying Spur). 6 wins. See above. Domielle (Encosta de Lago). 5 wins from 1300m to 1900m, A$141,325, AJC Cuddle H., STC Parramatta Leagues Club H., 2d Illawarra TC Keith F Nolan Classic, L, AJC Turf H., Jim Donohue H., 3d BTC Doomben Roses S., Gr.3, STC Theraces.com.au H., 4th Queensland Oaks, Gr.1. Producer. WITH A PROMISE (I am Invincible). 8 wins-2 at 2-from 1000m to 1600m, A$300,475, to 2017-18, BRC Tails S., L, GCTC Silk Stocking H., L, Qld Tatt's RC Singapore Airlines P., Ipswich TC TL Cooney H., 3d BRC Ezidebit H., Kartaway H.
Boyer. 9 wins-1 at 2-to 1450m, 2d TRC Stile 2YO H., Cadbury Favourites 2YO H., 3d TRC Calvary Hospital 2YO H.
Regas. 6 wins-1 at 2-to 1500m, A$100,025, 2d VATC Harvie Picken H., 3d MRC St Jude H., VATC Canonise H.
Clouds Over Kalbar. Winner at 1550m, 3d BRC Mekoe Accessories H.
Knight Scorpio. 4 wins at 1600m, 1700m, Singapore TC Benchmark 53 H., The Hornet H., Class 4 H., 2d Singapore TC Class 4 H., 3d Singapore TC Safety Outlet Initiation P., Class 4 H.
Flying Peregrine. 3 wins from 1300m to 2000m in Aust. Devil's Claw. 2 wins at 1000m, 1200m in Aust. Magic Dallas. 6 wins to 1350m, A$227,910, BRC Rochele Painting H., 2d ATC Paramount Function Centre H., Theraces H., Tab.com.au H., Big Sports Breakfast H., Drummond Golf H., Camelot at Coolmore H., 3d ATC Bob Rowles Tribute H., Tab.com.au H., Alan Mann H.
SURIA (Danehill). 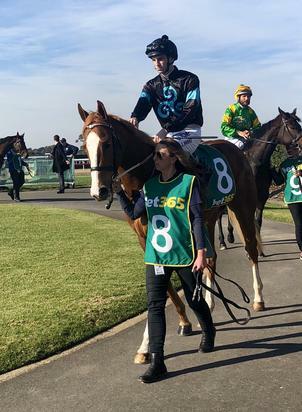 2 wins-1 at 2-at 1100m, 1600m, MVRC Great Western S., L, SAJC Walter Brown S.H., L, 3d VRC AV Kewney S., Gr.2, Moonee Valley Oaks, 4th VRC Hardy Brothers Prelude S., Gr.3. Hermoso (Rassendyll). 4 wins from 1600m to 2200m, A$133,875, VATC Holmesglen H., Beaconsfield H., 2d VRC AV Kewney S., Gr.2, STC Phar Lap S., Gr.2, VRC Dr Pepper H., MVRC Mumtaz Mahal H., 3d VRC 3MP 2000 H., VATC Select H., 4th VRC Oaks, Gr.1, VATC Dalgety S., Gr.3, Heath S., L. Producer. Race Record: 1 Starts 0-0-1 A$2,000.